Situated in the spectacular Southern Peninsula and boasting beautiful views of the Indian Ocean, the centre is ideal for school or youth camps, leadership training, church retreats or seminars. Water’s Edge can accommodate groups of up to 62 guests. 3 Dormitory-style rooms with bunk beds are spacious, cheerful and spotlessly clean. 2 smaller flatlets with single beds accommodating 2 & 5 guests. These flats have their own bathrooms and are ideal for group leaders. Large, fully-equipped self-catering kitchen with fridge, freezer, stove and microwave. Cutlery and crockery available on request. R3600 per night over weekends (Friday and Saturday and Sunday nights, as well as public holidays forming part of long weekends). R2500 per night during midweek (Monday to Thursday nights, excluding public holidays forming part of long weekends). (These minimum rates are negotiable depending on the season). Water’s Edge Accommodation Centre’s beautiful seaside setting makes it the perfect venue to relax and enjoy the nature without having to go anywhere. However, if you are keen to explore, there are many attractions to enjoy in the immediate vicinity. Explore the quaint and historical naval town of Simonstown with its many art galleries, shops and restaurants to suit all styles and tastes. Boulder’s Beach, famous for its penguin viewing and award-winning restaurant, is within walking distance. 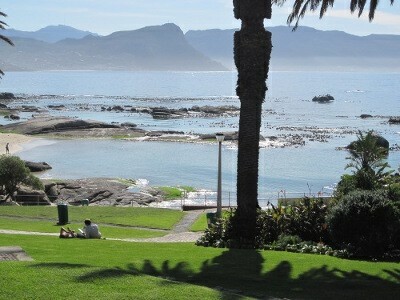 Golfing, bowls and squash at Simon’s Town Country Club. Popular Seaforth Beach & Restaurant, famous for their delicious seafood, is on your doorstep. Explore the immediate magnificent Southern Peninsula including– idyllic Scarborough, Kalk Bay harbour, Fish Hoek and Muizenberg beaches where watersports can be enjoyed. Silvermine Nature Reserve with beautiful nature trails in the Cape Fynbos.